It would've been creepier if you hadn't specified that the toad was a baby! I don't know what the species is, but there are a few predatory spiders including some that catch small birds. 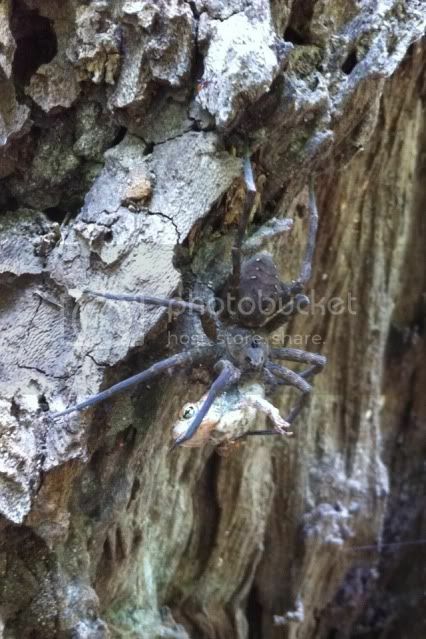 Looks like a fishing spider to me. It's a bird eating spider that never went to school. Could also be a bird eating spider that needs glasses. Hey! Don't you guys know a toad eating spider when you see one? Could also be a cat eating spider having a light snack. I shouldn't have looked at this.